The most effective coaching session is when neither coach nor coachee are in a state of stress. But how do we get to a calm place, when we all live with, and experience, stressful situations wherever we go? On March 1st, the DC Area Institute of Coaching presents a private lunch & learn workshop where you can learn a simple technique to immediately relieve stress for you and your coachees. 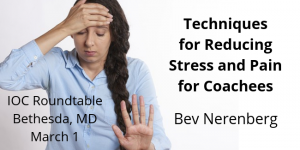 Join us for Techniques for Reducing Stress and Pain for Coachees (and Coaches!) presented by Bev Nerenberg. Our coachees are under some degree of stress virtually all of the time, from a little to a LOT! – and so are we as coaches. As long as our coachees are in a triggered state, they are only so coachable. (And if we coaches are stressed, we carry that into the coaching space with our coachees). So how can we quickly and simply reduce stress for ourselves and our coachees? How can we do the work that can only be done in a non-triggered state? You will learn the basics of a technique called EFT Tapping and how and why it works. You’ll experience its effectiveness directly and immediately for relief from distressing emotions and pains. You’ll leave knowing how to perform it on yourself. You’ll leave knowing how to introduce and teach it to your coachees. 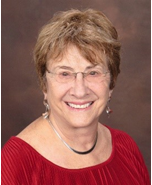 Bev Nerenberg worked as a Senior Vice President of Operations for a regional computer distributor and then as Director of Operations for a chain of Montessori schools. She is an experienced business leader, familiar with most of its inherent challenges and solutions. Everything shifted for her in 2008. That is when she discovered Emotional Freedom Techniques from a DVD called The Tapping Solution. It changed the direction of her life. From her first experience with EFT – causing her lifelong acrophobia (fear of heights) to disappear, to the relief she got from anger, jealousy, physical pains and worry, she knew she wanted to share this modality with as many people as she could. Bev then devoted herself to learning all she could about Emotional Freedom Techniques by reading, taking courses, and practicing, practicing, practicing. She became a Certified EFT Practitioner, and then founded her own company, Wellness At Your Fingertips. This event is limited to 25 people, so REGISTER NOW.